The group is meticulously working towards investigating the significance of various electrospinning parameters and the manner in which they affect the fiber diameter. Our group has been successful in generalizing the “concept of minimum electrospinning voltage” for different class of polymers such as Polyacrylonitrile and Polyvinyl alcohol. 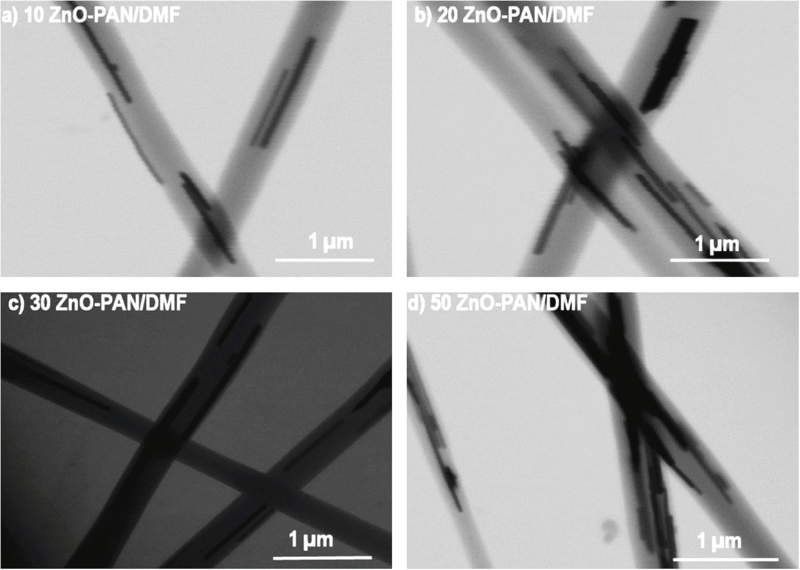 The aim of such fundamental studies is to achieve excellent control over reproducibility of electrospinning technique and fibers with controlled/desired diameter. Such repeatability of the process and controlled fiber forming capability is mandatory for industrial applications like filtration, flexible conductors and semi-conductors and biomedical applications like tissue engineering. Since most of the polymers that are electrospun are visco-elastic in nature, effect of elasticity and polymer relaxation on limiting the fiber diameter cannot be ruled out. It becomes imperative to study the independent effect of elasticity on final fiber diameter. Elastic effect can be isolated from the viscous effects by using Boger fluids which as described by D.F.James are elastic liquid with constant viscosity. In our recent studies on electrospinning of poly(acrylonitrile) it has been found that diameter of nanofibers depends primarily on solution properties and does not seem to depend on electrospinning process parameters such as spinning voltage, distance, and flow rate. The observations showed that inherent properties of the polymer solution play a fundamental role in limiting fiber diameter. In our current research using PVA Boger solutions a strong correlation could be established between the fiber diameter and relaxation time of the solutions, while no correlation could be seen with their viscosities. 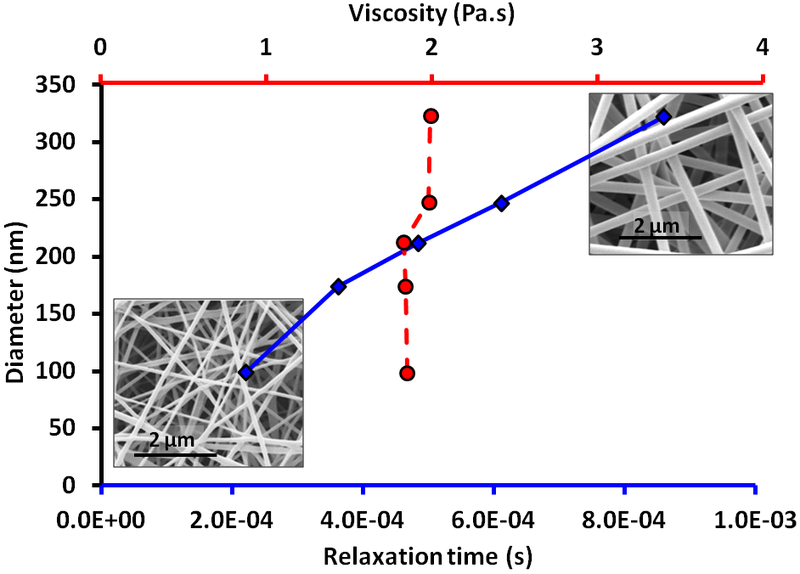 A direct impact of increasing elasticity was also seen on the electrospinning of PVA Boger solutions where the fiber diameter increased with increasing flow rate for polymer with high relaxation time. The experiments suggest that diameter of the electrospun fibers is principally governed by the elastic properties of the spinning polymer solution and is fairly independent of the processing parameters such as spinning distance, voltage and flow rate. 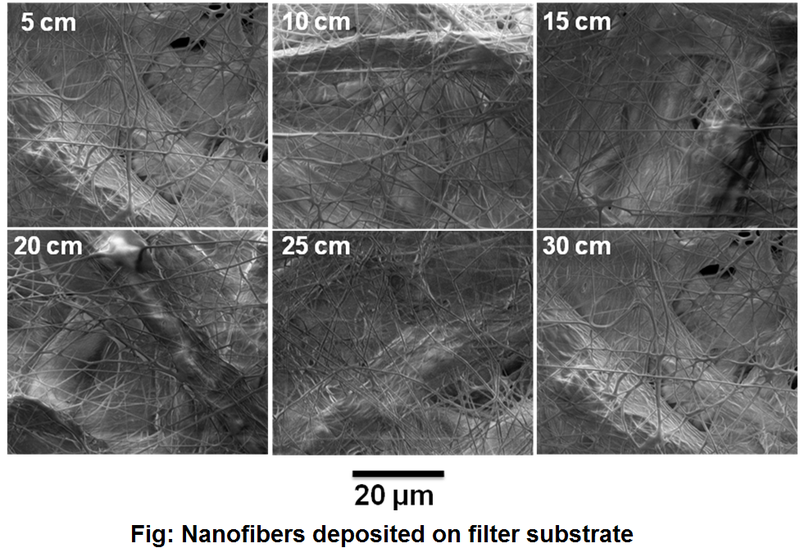 Our group has used PVA nanofibers fabricated using benign solvent like water for mass production of nanofibrous filter substrate. Methodologies have been developed to ensure continuous spinning of the polymer dope with uniform deposition up to 0.3 GSM. Filter substrates coated with nanofibrous web has shown enhanced fuel filtration capability up to 97%. Our group in collaboration with All India Institute of Medical Sciences-New Delhi, has developed PCL nanofibrous scaffolds with enhanced optical transparency and hydrophillicity for corneal regeneration. Optically transparent PCL membranes were obtained using Plasma treatment (put a link for plasma page). Such scaffolds have shown to be highly biocompatible for limbal epithelial cells. Fig: Digital photograph showing optical transparency of scaffolds. (A) Wet amniotic membrane through which printed text is clearly visible. (B) Wet PCL membrane showing translucency through which the printed text is slightly visible. (C) Wet pPCL showing transparency through which the printed text is clearly visible. 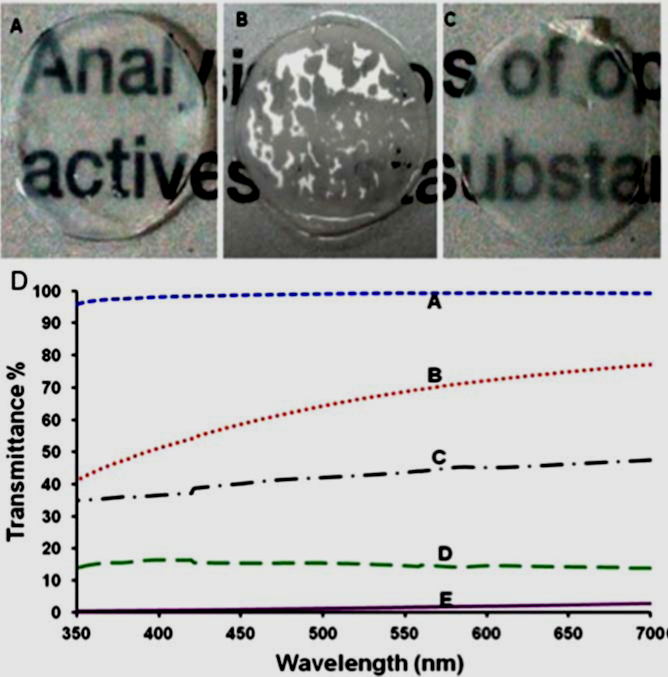 (D) Ultraviolet-visible spectra for optical transmittance at a wavelength of 700 nm for (A) glass coverslip showing maximum transmittance of 99%; (B) wet amniotic membrane showing transmittance of 77%; (C) wet pPCL showing transmittance of 47%; (D) wet PCL showing transmittance of 13%; and (E) dry PCL showing least transmittance of 3%. Fig: Scanning electron microscopy images of LECs cultivated on electrospun nanofibers for 2 weeks. (A) Human limbal epithelial cells grown on pPCL surface showing smooth cell sheet and close association with neighborhood cell by forming tightly opposed cell junctions. (B) Apical surface showing numerous short microvilli at higher magnification. (C) Human limbal epithelial cells on PCL surface showing random distribution with larger microvilli. (D) Apical surface of PCL showing distended microvilli.